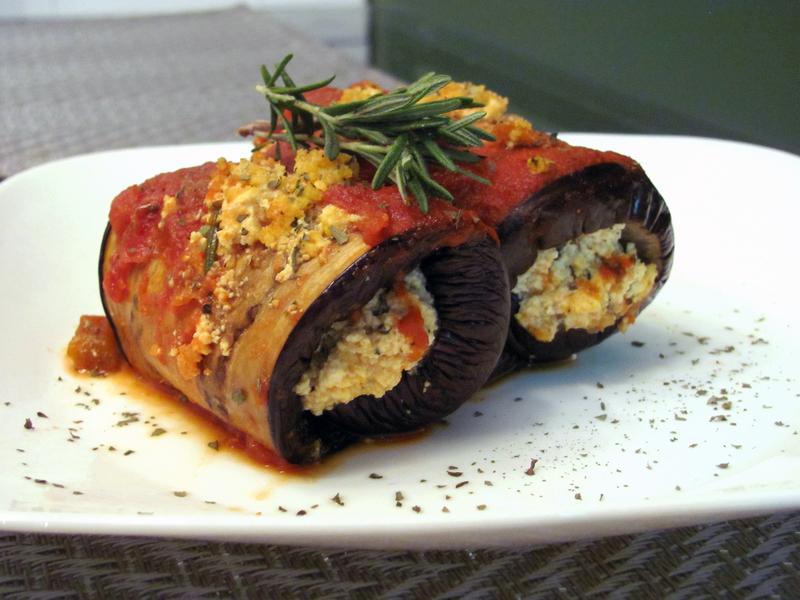 So this recipe is pretty much the amazing hippie love child of eggplant Parmesan and stuffed canneloni. This uses my delicious tofu ricotta cheese recipe. This tofu ricotta is amazing in stuffed shells, regular manicotti noodles or on baked ziti or spaghetti. If you love fresh basil and garlic, which are components in a lot of Italian food, this will give your taste buds the al dente treat they’ve been craving. Using fresh herbs really makes this dish. Tonight, as pictured, I used dried basil, which is still good once it cooks and the flavors come out. Preheat oven to 375°. Cut tops off eggplants and slice vertically (from where the stem was to the bottom) 1/2 inch thick. Generously spray baking sheets with nonstick spray. 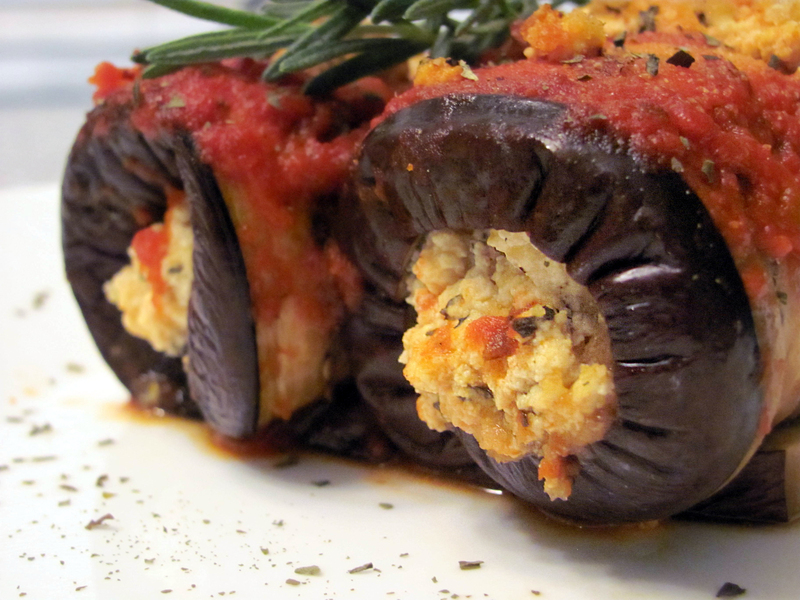 Sprinkle eggplant slices lightly with salt and arrange on the baking sheets. Bake on the top rack for no more than 10 minutes. Doing this will soften them but not actually cook them enough so they become creamy and won’t hold together. They will usually start to steam in the oven. Tonight there was steam coming out the top of my oven. I may or may not have had a mini panic attack, but it was in vain. They were fine. Remove eggplant spices from oven and carefully move them onto a large platter to cool about 5 minutes, or longer until you can touch them without them being too hot. Spray a glass baking dish with nonstick spray and about 1/2 cup marinara or pasta sauce. Spread the pasta sauce around so it covers the bottom of the baking dish. Place about 2 tablespoons of the tofu ricotta on the large end of the eggplant slice and gently roll it up, similar to rolling up a burrito. 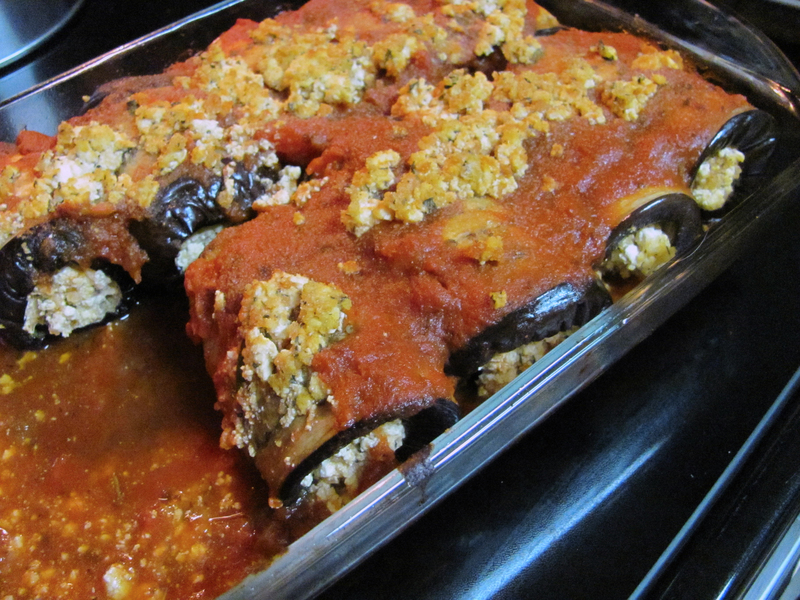 Place each one side by side into the baking dish, just like regular manicotti. Top with remaining pasta sauce and any remaining ricotta and spread evenly. Bake on middle rack for about 20 minutes, or until eggplants are fully cooked. Makes about 6-8- servings of 2 manicottis each.